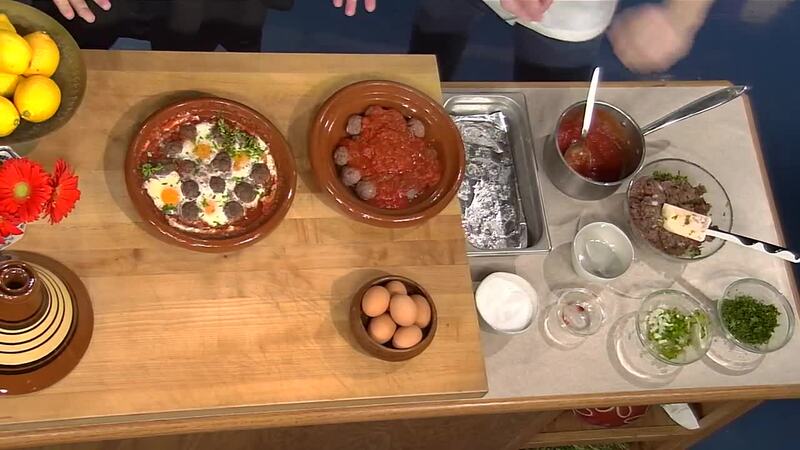 SOUTHFIELD, MICH (WXYZ) — You're invited to come out and enjoy 5 courses of French-Moroccan cuisine by Chef Brandon Zarb with proceeds going to NW Goldberg neighborhood and Original Creativity’s 6102. Mix the tomatoes with chopped onion, paprika, cumin, salt, black pepper, parsley, cilantro, garlic, olive oil, and bay leaf in the base of the tagine. Cover and bring to a simmer over medium-low heat. Once simmering, reduce the heat and allow the sauce to simmer gently for about 20 minutes. Combine the ground beef and lamb, onion, green pepper, paprika, cumin, salt, ground cinnamon, black pepper, cayenne pepper, parsley, and cilantro. Use your hands to knead in the spices and herbs, shape the kefta mixture into very small meatballs the size of large cherries – about ¾ inch in diameter. Add the meatballs to the tomato sauce, along with the water, and cover. Add the eggs to the tagine carefully. Cover and cook for an additional 7-10 minutes until the whites are just set. Garnish with fresh chopped parsley and cilantro and serve immedietley.